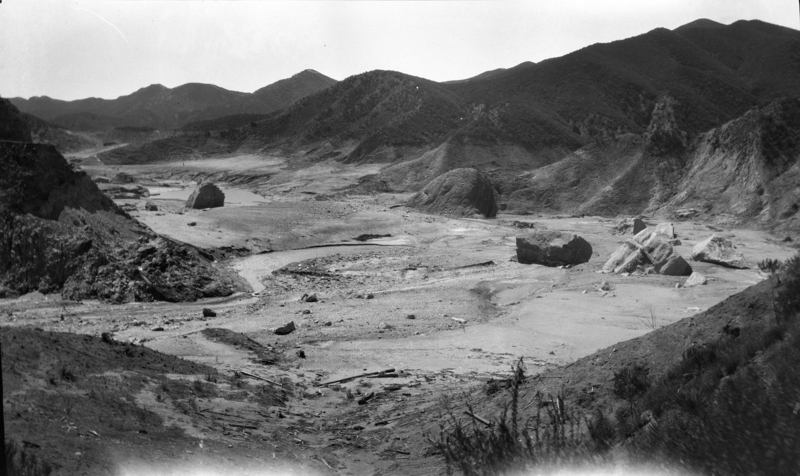 SCVHistory.com DI2811 | St. Francis Dam Disaster | Floodpath & Rubble Just Below the Dam, 1928. View looking south (downstream) between the dam and the Powerhouse No. 2 community at Stator Lane. 4x6-inch BW film transparency (larger than 4x5). The unknown photographer is standing just above the high water line. Compare with this photo and this photo. DI2811: 9600 dpi jpeg from original 4x6-inch transparency purchased 2015 by Sharon Divis.